Twelve years ago the future of METCO was unknown. There was limited structure, few employees knew what their role was, and many didn’t know who their supervisor was. There were no annual budgets and no company goals. Customer service took a back seat to day-to-day survival. Current owner and president, Paul Knower, was involved with almost every task and decision. Sales and profits were on a steady decline and something had to be done. It was then that Paul made the bold decision to start working “on the business” instead of working in it. Since then, there have been countless changes within the fuel systems division that have led us to where we are today. Change can be intimidating, but good change usually leads to progress. 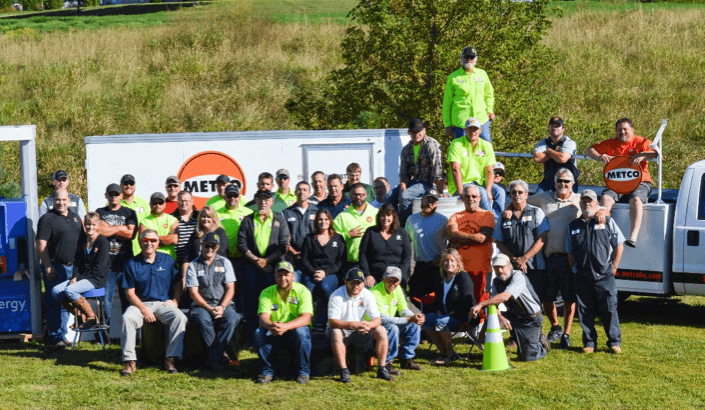 Those employed back then, as well as those who joined the team along the way, have made many sacrifices and displayed their dedication to making METCO a success. This is my opportunity provide a brief review and well deserved recognition. The managers of our operational units (finance, service, construction and purchasing) have an established relationship that is both supportive of each other and of the company’s vision and goals. You can’t train people to be dependable and take ownership of their responsibilities. This is what they do and their actions filter throughout the rest of the company. Construction drives our top line sales and service establishes our customer base. For METCO, one can’t exist without the other. We are fortunate to have a strong sales, estimating, and project management team that work together with the competitiveness and sense of urgency that is required to provide excellent customer service. Our group of field installers and technicians are second to none and simply get the job(s) done. They are the ones putting in long days on the road, working in the heat, rain, cold, and snow. They are the ones sacrificing time with their families and friends to fulfill the promises that we deliver. We used to be limited to performing only one large installation project at a time because we had a relatively small crew. Currently, our construction manager is assisted by two project managers, an administrative assistant, and three site foremen who work side-by-side with eight other field guys. We are now capable of installing three ground up projects at once along with multiple day-to-day projects. Next year we will be hiring three more construction workers and our goal is to be able to do four new installs simultaneously. Not so long ago, our service team consisted of a manager and six technicians. Today, we are structured with a manager, an assistant manager, and a customer service representative working with thirteen field technicians. Eight of those techs, with the goal of continuously adding more, are in the on-call rotation meaning they are adequately trained to handle most after hour emergency calls. Exceptional teamwork and willingness to help each other are critical to their success as one tech cannot be trained in everything. We will continue the recruiting process in order to annually add two techs over the next three years. Parts and purchasing are critical to construction and service. I can remember when our shelves were stocked with obsolete parts, our techs couldn’t get the parts they needed, and construction projects were delayed because material wasn’t getting ordered on time. Not to mention we weren’t getting the best pricing because we didn’t know what our costs were. This simply doesn’t happen anymore. In fact, the systems our purchasing manager has implemented have allowed substantial sales growth (almost double) with only adding minimal overhead costs. Timely and accurate financial statements. That was the running joke with our finance manager ten years ago. Are we making any money? What’s a budget? How’s the cash flow? We didn’t know if we were going to make a profit until the taxes were done. Today we have an annual budget and the company is run by it. We have accurate (and timely) data to analyze and compare which allows us to project the year-end sales and profit by the end of the third quarter. Behind the scenes we have solidified our support staff. Human resources, safety, phone reception, accounts payable and receivable, and warehouse duties are all areas we made certain to focus on. Every role is integral to our success. Recruit, train, and retain is a top priority for us. It’s imperative that we give all of our employees the proper tools to succeed. There is no technical college where you can earn a degree as a fuel system installer or technician. We have to educate and provide all training for our people to become certified. This doesn’t happen overnight. Fortunately, we have employees who consider this a challenge and an opportunity to grow with the company. Just as important, we have an owner who recognizes the importance of this and continues to invest in his employees. This is the best team METCO has ever assembled and the team-first culture that has evolved over recent years will no doubt carry us into the future. It is my responsibility to make sure the right people are in the right position to be successful. It has been a challenge at times to get to where we are, but well worth some sleepless nights. The people I work with make my job a whole lot easier and I’m dedicating this newsletter to all of our employees as a “thank you.” It’s these folks that keep METCO rolling along! I’m proud to be a part of it.